Guelph Junction Railway (GJR) was established in 1886 by a Special Act of the federal government to foster economic growth in Guelph and the surrounding communities. The City of Guelph has owned the railway since 1908. GJR operates on 38.6 kilometres of track that runs from Guelph Junction near Campbellville, Ontario to Guelph’s northwest industrial park. Guelph Junction Railway connects with the Canadian Pacific Railway and the Canadian National Railway. How much do you know about rail safety? No matter your age, being safe around railway crossings and tracks is extremely important—in fact, it could save your life. Visit Operation Lifesaver’s webpage for helpful resources for kids, drivers, pedestrians and more. Guelph Junction Railway is used to transport industrial products such as grain, plastics, and lumber. Guelph Junction Railway operates safely and in compliance with Transportation Canada regulations. Rail transportation is efficient over long hauls and is becoming more attractive compared to trucking for linking supply chains. Short line railways, like the GJR, provide the local link for long distance delivery. Canadian National Railway (CN) and Canadian Pacific Railway (CPR) will be using larger rail cars with heavier loads. To accommodate this, GJR is investing in its infrastructure to handle the new larger railcars. The City owns Guelph Junction Railway and it is managed by Guelph Junction Railway’s board of directors. Guelph Junction Railway’s volunteer board of directors provides strategic governance and direction to Guelph Junction Railway’s interim Chief Executive Officer to meet the City’s objectives for the railway. 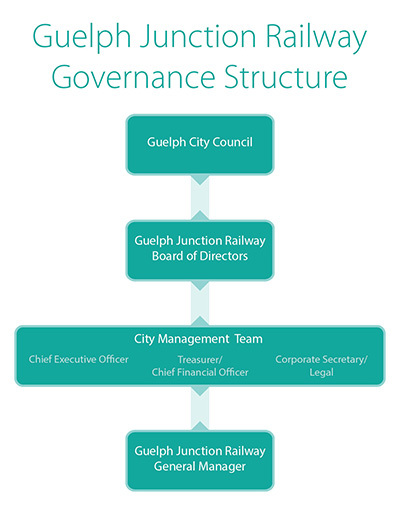 A City management team, created in November 2015, provides the Guelph Junction Railway board and general manager additional support and resources for legal, financial and business development matters. Last Updated: April 16, 2018.